It wasn’t supposed to be this hard. If America could send a man to the moon, shouldn’t the best surgeons in the world be able to build an artificial heart? In Ticker, Texas Monthly executive editor and two time National Magazine Award winner Mimi Swartz shows just how complex and difficult it can be to replicate one of nature’s greatest creations. Part investigative journalism, part medical mystery, Ticker is a dazzling story of modern innovation, recounting fifty years of false starts, abysmal failures and miraculous triumphs, as experienced by one the world’s foremost heart surgeons, O.H. “Bud” Frazier, who has given his life to saving the un-savable. His journey takes him from a small town in west Texas to one of the country’s most prestigious medical institutions, The Texas Heart Institute, from the halls of Congress to the animal laboratories where calves are fitted with new heart designs. The roadblocks to success —medical setbacks, technological shortcomings, government regulations – are immense. Still, Bud and his associates persist, finding inspiration in the unlikeliest of places. A field beside the Nile irrigated by an Archimedes screw. A hardware store in Brisbane, Australia. A seedy bar on the wrong side of Houston. Until post WWII, heart surgery did not exist. Ticker provides a riveting history of the pioneers who gave their all to the courageous process of cutting into the only organ humans cannot live without. Heart surgeons Michael DeBakey and Denton Cooley, whose feud dominated the dramatic beginnings of heart surgery. Christian Barnaard, who changed the world overnight by performing the first heart transplant. Inventor Robert Jarvik, whose artificial heart made patient Barney Clark a worldwide symbol of both the brilliant promise of technology and the devastating evils of experimentation run amuck. Rich in supporting players, Ticker introduces us to Bud’s brilliant colleagues in his quixotic quest to develop an artificial heart: Billy Cohn, the heart surgeon and inventor who devotes his spare time to the pursuit of magic and music; Daniel Timms, the Brisbane biomedical engineer whose design of a lightweight, pulseless heart with but a single moving part offers a new way forward. And, as government money dries up, the unlikeliest of backers, Houston’s furniture king, Mattress Mack. In a sweeping narrative of one man’s obsession, Swartz raises some of the hardest questions of the human condition. What are the tradeoffs of medical progress? What is the cost, in suffering and resources, of offering patients a few more months, or years of life? Must science do harm to do good? Ticker takes us on an unforgettable journey into the power and mystery of the human heart. Mimi Swartz is a long-time executive editor at Texas Monthly, and a two-time National Magazine Award winner and a four time finalist. The coauthor of the national bestseller Power Failure, with Sherron Watkins, about the failures at Enron, her work has appeared in Vanity Fair, The New Yorker, Esquire, Slate, and her op-ed pieces appear regularly in the New York Times. “Doctors and researchers have long recognized the need for an artificial organ, or . . . a machine of some kind that can assist a diseased heart until a transplant candidate can be found. The Holy Grail is a device that would make transplants altogether unnecessary. The search for that grail has been, as Mimi Swartz shows in her fascinating book, as complicated as the essential organ itself. Ticker: The Quest to Create an Artificial Heart tells a story as big as Texas. . ."
“Even casually interested readers will become fascinated by Swartz's vivid depiction of Frazier at work in the operating room…Swartz is a witty, savvy, seasoned journalist, and she offers a welcome history of significant medical advances." 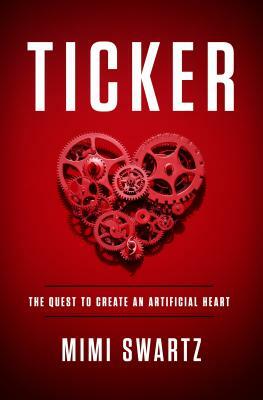 "Ticker is a page-turner, a mind-expander, a heart-pounder. Swartz unveils a wild story of medical innovation with the keen eye of a storyteller."